NaNoEdMo hour counter is at 39 hours, 48 minutes, and I haven’t done any editing for today! The big changes to Orpheus/Underworld are underway, and I’ve broken ground on “The Time Bubble Blues.” Haven’t gotten much done on HTRYN and “The Angel’s Charlie” since last week. The Veronica Mars movie, whoohoo! Shiny new Chromebooks for Camp Nanowrimo. The lecture notes I brought back from Odyssey and the prospect of this year’s summer workshops coming. Getting locked out of my office, which is why I don’t have the Kindle or lots of my other gear which is locked inside. 😉 Checking out my assigned cabin and trying to get a little family reunion together. I don’t think I’ve actually talked about my NaNoEdMo schedule here before. I’ve built a special Excel spreadsheet to set my day-to-day editing targets, because it isn’t as simple as 1 hour, 37 minutes every day. I have more time available for editing on the weekends than weekdays for instance. 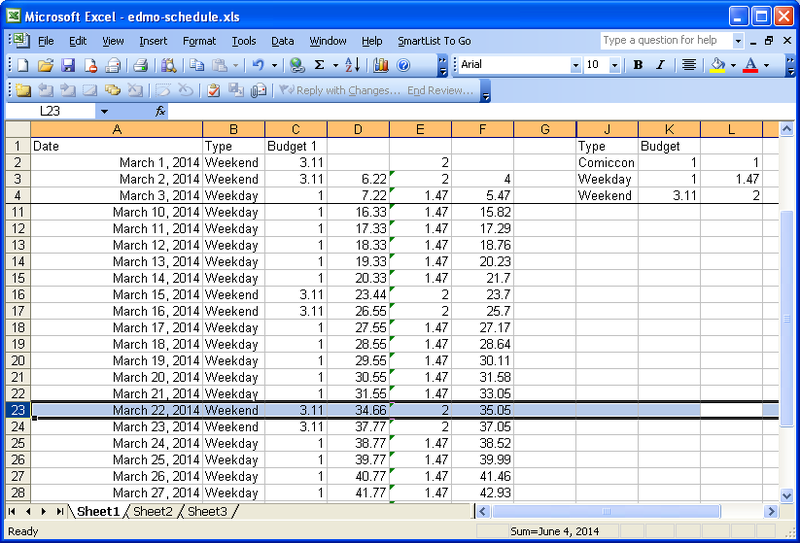 So, I set up a schedule with three types of days: weekends, weekdays, and Comicon. I knew I’d be crazy busy for Comicon, so that Sunday I only gave myself a target of an hour. Actually, I think I did a little less, but I’d done extra time the day before. The weird thing about the schedule, though, is that there isn’t a single target per type of day otherwise. I’ve set up two formulas. For one, I’m only committing to doing 2 hours per weekend day, and I set the time for a weekday to make up the balance of getting to 50 hours in the month, which comes as a little less than an hour and a half on a weekday. For the other schedule, I only commit to an hour on a weekday, and set the weekends to make up the balance, which is over 3 hours every weekend day. And generally, I don’t worry too much if I’m caught up on at least one of these schedules. They pass each other every week or so, so it doesn’t matter that much. If I’m actually ahead on both schedules, then I know I’m doing pretty well, and if I’m between, then there’s the second ‘stretch’ target a little ahead of me, encouraging me to keep going. So, I guess that’s about it. 15 hours, eleven minutes to get done over the next nine days! Still listening to ‘The Handmaid’s Tale’ by Margaret Atwood on Audible, and Escape Artist podcasts, and started listening to ‘Culture: Excession’ again, though I feel like it’s a little hard to follow on audio, sigh. Finished the Secret Circle trilogy, and I’m branching out to some new markets of short stories, reading from ‘Shimmer’ and ‘Andromeda Spaceways In-flight Magazine’, as well as catching up on Strange Horizons. NaNoEdMo clock count: 28 and a half hours! I’ve finished my revisions on ‘Gotta Have that Look’, and started making some big changes to my Orpheus story. I haven’t given up on HTRYN and “The Angel’s Charlie,” but going through the world triage seems to be dragging on a little, sigh. Write-ins, the Odyssey video chat salon, and getting back to using my Alphasmart Dana on the bus. What’s Up Wednesday? Another Blizzard! Still working through my Secret Circle ebooks and ‘The Handmaid’s Tale’ by Margaret Atwood on Audible. Read many Escape Pod stories this past week and no PodCastle, because I’ve been trying different ways of choosing my podcasts and Escape Pod was coming up first. I also read through a little ebook I got ages ago, “Alias Recruited” while I was at Comicon on Sunday, mostly while waiting for panels to start. It was a fun little read, part of a paperback prequel series for the Alias TV show with Jennifer Garner, which I never really got into that much but is still on my ‘to watch’ list. NaNoEdMo revision, baby! I’m up to 17-ish hours so far, and pleased with the progress I’ve made, especially the HTRYN classes for “The Angel’s Charlie” which have been going much faster than the first time I revised a novel with them, and ‘Gotta Have that Look’ which should be ready for critique by Monday. Well, I borrowed a book and a half from the library this week. 😉 Whoever published the original ‘Secret Circle’ trilogy in ebooks decided to make them two ebooks. I got the first half of the trilogy years ago, and finally finished up to the end of part 1 of ‘The Captive.’ The other half was available at the library, so I should be finished it another week or so. Still listening to some Audible books, including ‘The Handmaid’s Tale’ by Margaret Atwood, which has become my go-to book for listening to when I’m washing dishes or doing other chores in No-screen time, because it’s what’s currently loaded on the little Audible Otis (which doesn’t have enough of a screen to count.) And enjoying the PodCastle and Escape Pod as much as ever. NaNoEdMo is underway here, as well as a few places on twitter. I’ve been working on revising my novel “The Angel’s Charlie” on the Holly Lisle revision plan, as well as some shorter pieces to rewrite. The monastery playlist! Old ‘Brothers and Sisters’ episodes. Camp Nanowrimo on the horizon. Let’s see. The office move happened on Monday, went pretty well though our network was down until 4pm. Had another good write-in over the weekend, great to see Elizabeth Twist and bond with her about revision. And I got my invitation to The Never-Ending Odyssey reunion workshop yesterday! Okay, so first off: the hour tracker is at just over 41 hours, which means I do have quite a bit of work to cram into the last 3 days of the month, but then, I’ve got the long weekend coming up, so it’s certainly doable. I was making some good progress on the second novel I’m going through ‘How to Revise your Novel’ with, The Angel’s Charlie; I’m nearly finished the second lesson, promise counts, but I was also feeling that working on the novel was adding to my stress levels a bit. So, instead of working myself into a stress breakdown or giving up on EdMo, I decided to switch back to polishing fanfiction and see if that was better, and I’ve been enjoying it a lot and finding it restful by comparison. I’ve gotten a few chapters through the sequel to “Arrow through my Soul, A Roswell Alien in Metropolis. Not quite sure if I’m going to stick with fanfic through the rest of the month, or go back to HTRYN, but I’m sure I’m going to reach 50 hours one way or another! 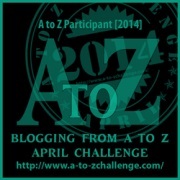 And then it’ll be time for Camp Nanowrimo and my A-Z challenge. I think the lineup there is in pretty good shape; I have over 20 spotlight interviews already and more should be coming in soon. At least one of my Camp Spotlights is probably going to get held over until May, just because there won’t be room in the A-Z alphabet, because things never get slotted in quite that neatly. 😉 But they should make great reading even after Camp is finished. Well, I got another Watermelon in the face moment today… and I’ve decided not to worry about whether the little setbacks I need to rise above are watermelons or some smaller fruit. It makes me smile to call them watermelons, so that’s what they are. So, as they suggested, I will continue to write and apply my talents. For the time being, that means more Edmo and continuing to prep the revision of “The Angel’s Charlie.” I’m almost finished the despair reading, and have actually reached the point where I ran out of plot, and desperate to reach 50k for the Night of Writing Dangerously, started writing a teaser for a sequel. 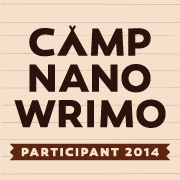 I’m looking forward to Camp Nanowrimo. Six of the regulars over at Stringing Words have finally managed to nab a cabin together, on our third try. I think I may not have much time to prepare, so I’ll just pants it more than usual!